Just wrote this general guide. This guide should help the user in replacing the fork oil, fork spring and fork seals. As always this is just a guide, consult your maintenance manual for specific instructions as if you do not perform this procedure correctly you may get injured. 9 Using screwdriver unscrew the rebound dampener screw to it?s full up position (counterclockwise). Do this gently or you will ruin the screw. 9 There are special tools for driving the bearing into the slider but a gently used screwdriver and hammer has been effective. I stress the word gently. 9 Screw in the rebound dampener screw and count the turns. Assemble forks on bike in reverse order of disassembly. great write up from Scudman. I am playing with my suspension and such and so learning about suspension fluid. Pregen ninja 250 with newgen ninja 250 suspension modded. though our forks do not get got, I read it is recommended to get fluid with a index (which indicates its resistance to change it properties at higher working temperatures) of greater than 150.
also probably ordering a fork rebuild kit, not sure yet.. Wondering how you bike gurus can share some light on for oil info..
Race tech says they use Spectro Oil and Bel-ray oil is the closest in properties to it. @Qomomoko- I run 15wt oil with .7 springs from Racetech in my newgen 250. I also cut new preload spacers to increase the preload. I did not do emulators or upgraded preload adjuster caps. Trying to keep costs down. It has been working well for me. 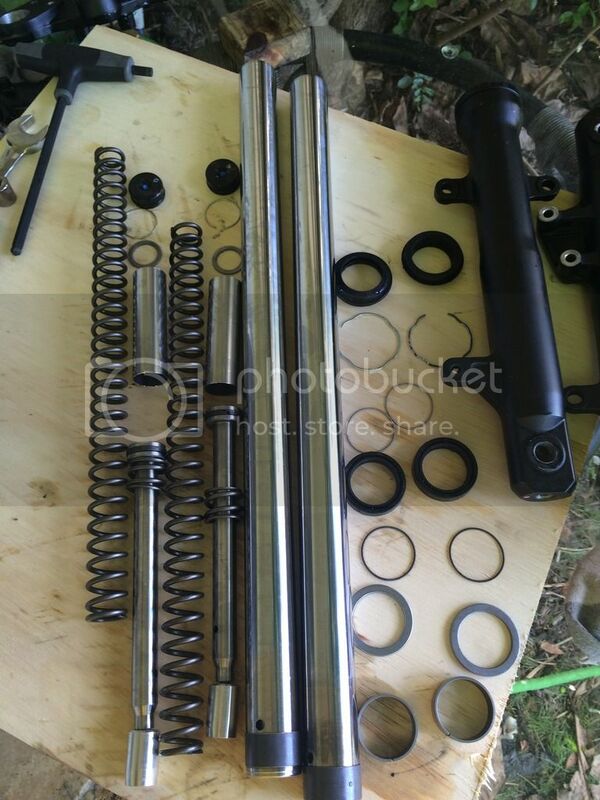 I have all the parts to start the build again (excepts brake pistons)…. ended up getting Spectro Fork oil SAE 5. This was after much talk with them. Will adjust after I ride the bike. I am also about 15# heavier but will loose the weight as I pick up exercising the .75 spring I got be a better fit. I typically start with 10W oil and this works with the adjustable suspensions. It works quite well on the street and the adjusters are placed at the lower levels. Mostly close full out. With the lower viscosity your adjusters will be mostly fully in. You may have to try different oils until you get the right combination. The level is important as that changes the spring rate of the suspension. On your 250 15W seems to be about right and adjust the oil level higher to make up for soft springs. 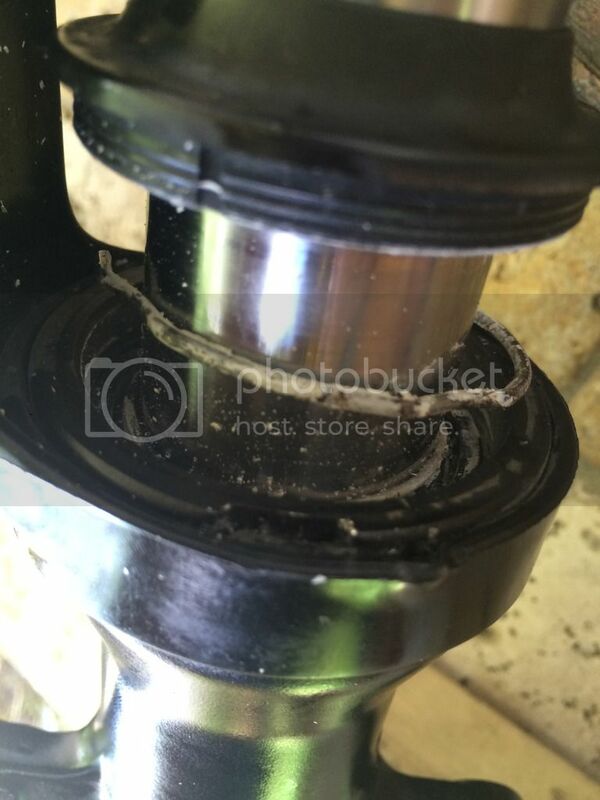 You may want to skip the spacers as they do not change the spring rate. They only adjust the height of the bike. Fork oil height will also alter the height of the bike. I second what Tony says. I have been using them for about 10 years or so and have not had to change a seal since then. "Dude, a bike will keep you young but the wrong bike will stop you from getting older, there IS a difference." How have I never seen this. That's brilliant. I used to do that on my WR250 with a simple piece of bond paper. Always worked just fine.